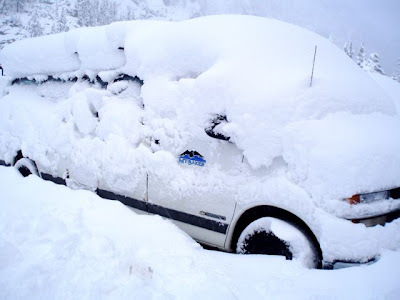 American Alpine Institute - Climbing Blog: Breaking News: Record early season snowfall on Mt. Baker! 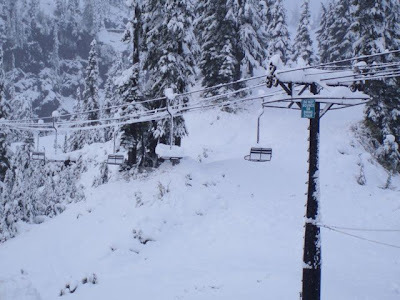 Breaking News: Record early season snowfall on Mt. Baker! Snowy drifts outside the Upper Lodge. The Mt. 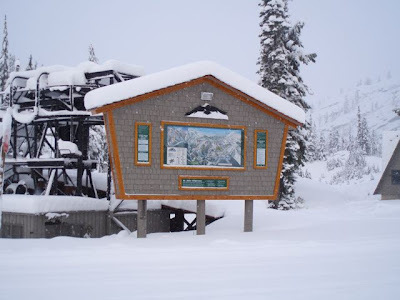 Baker Ski Area reported receiving 20 inches of snowfall on Wednesday night! This is the single biggest 24 hour snowfall for early October in recorded history! And it's still snowing! Preliminary forecasts call for a La Nina winter weather pattern of colder temperatures . . . the last significant La Nina pattern that affected this area was in the winter of 1998-99, when Mt. Baker had its world record snowfall of 1140 inches! This is a great sign for us all. Skiers and snowboarders should be prepared for ample powder days! This is also a good sign for climbers - if we have a big snow winter with cold temps to keep the snow around, then the glacier climbing in the Cascades next summer could very well be stellar late into the season . . .